Do You Have Inbox Delivery Problems? filter tests and a good reputation won't help. You can access some of our best features right away! According to Return Path’s 2016 Inbox Delivery Study, six criteria are used to define your brand’s ability to win Inbox delivery. 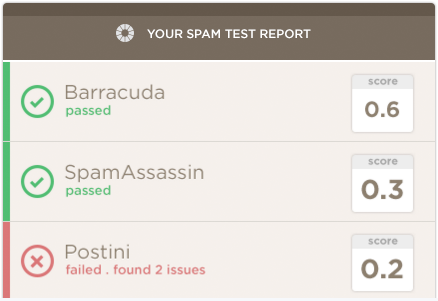 Spam Filters test two - Content and Infrastructure. And according to the same study, content plays a minor role in inbox placement and a solid reputation may not equal high inbox placement. Return Path manages inbox filters for over 3 billion inboxes worldwide. Both Litmus and Return Path’s emails routinely land in our (Makesbridge's) corporate junk folders. The goal was to engage in outreach to 5 different potential partner segments in a metered fashion. The aim was to allow their sales representatives the ability to devote the appropriate time to personally interact with each new lead. Integrate marketing capabilities and results data into popular CRM apps in minutes. Big data and machine learning are used to monitor reactions of your individual recipients, your audience and your industry. Google is justifiably secretive about its Gmail algorithms, so we safely assume it uses search-like algorithms to evaluate emails. And Return Path’s control over 3 billion inboxes gives its ISP customers data to pre-judge inbound emails. From a Sender’s point of view, you can no longer use an ESPs IP reputation, low spam, authentication and low complaints to win inbox delivery. Senders must constantly work at being fresh, targeted and relevant.. Solid inbox delivery and recipient engagement requires a strategy to address six points of brand perception. Makesbridge Delivery Detectives work closely with marketers on strategy to build and maintain their credibility and ultimately increase email ROI. We utilize data from many sources like Return Path, Litmus, email campaign responses, web traffic and social data to test and formulate a strategy. First we monitor email responses and web visit activity to see who will anchor your reputation. Then we identify a segmentation strategy and lead cross channel messaging campaigns designed to re-engage laggards without further damage to your email reputation. After we see results, we kick things up a notch with customer journey planning and message execution. Source: Return Path 2016 Email Delivery Study. Why must I use a work email?